1. With your right hand over the strings of your banjo, curl your fingers up as if they were holding a baseball bat. 2. Strike down on the 1st string with the nail of your middle finger. (This is your melody note). With your hand still in motion, let your right thumb come to rest on the 5th string. 3. Then lift up you right hand and quickly brush down on the 1st, 2nd, and 3rd strings with the nails of your middle and ring fingers. Again, your thumb will come to rest on the 5th string, as it did above. 4. Finally, your thumb will strike the fifth string. Tips: a. Keep your right hand fairly stiff. b. The first note of the clawhammer is your melody note. It could be on the 1st, 2nd, 3rd, or 4th strings. I suggest using you middle finger of your right hand for the 1st string, and your right index finger for the 2nd, 3rd, or 4th strings. Tunings: Old-time clawhammer banjo often uses different tunings to play the tunes. One of my favorite is G Modal tuning which is sometimes called “sawmill” tuning. 1. Start in G tuning: gDGBD. 2. Tune the 2nd string up from a B to a C by fretting the 2ndh string at the 2nd fret and tuning it up until it matches the 1st string played open. “Red Rocking Chair” is an old southern mountain tune that is also known as “Rain and Snow.” In western North Carolina, it was one of the favorite tunes of banjoist Obrey Ramsey. 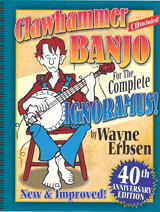 For more help learning clawhammer banjo, check out Wayne Erbsen’s new book, Clawhammer Banjo for the Complete Ignoramus! Watch a video clip of Wayne Erbsen demonstrating the Clawhammer Banjo Lick. In yoyr basic clawhammer lick video, what is the tuning of your banjo? Hi, Bob! In this video, the banjo is in ‘double C’ tuning, which is DCGCg.